While there are a number of concealers, foundations, and powders specially formulated for acne, there are few blushers that are specifically designed with blemishes in mind. There are, however, a number of products whose high quality or natural ingredients are gentle on your skin and won't make the condition any worse. In general powder blushes work well for oily and acne prone skin types, although some women to opt for gel or cream to powder types. Following are several products that might be good choices for those with acne prone skin. PlantLove Blush: This organic blusher is a good choice for blemish prone skin because it contains plant extracts that can help heal acne. The product comes in a range of shades and is available at Sephora. NVEY Organic Blush: Made with healing vitamin E, this powder blush comes in 8 colors. 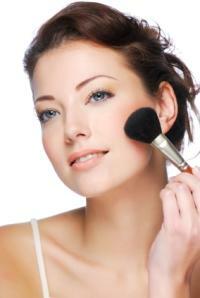 Mineral Makeup Blushers: Many women with acne prone skin have been pleased with the results of their mineral blush. There are many brands available, but not all are created equal. Look for mineral blush that that contains titanium dioxide and/or zinc oxide which have healing and anti-inflammatory properties that may help blemish prone skin. Avoid mineral blushes that contain paraben preservatives and other synthetic fillers. MAC Sheertone Blush: The MAC brand is a favorite among makeup artists, and the Sheertone powder blush provides sheer, buildable coverage and comes in a wide range of colors. Bobbi Brown Powder Blush: Another well-known name in cosmetics, Bobbi Brown powder blush is a silk formula that glides on easily over acne prone skin and is available in 19 shades. Consider blush from Estee Lauder and Clinique as well; these are two other brands that have a reputation for working well on all skin types, including those prone to acne. Many women with acne prone skin also have a tendency towards oily skin. If this is the case for you, look for oil free blusher products to minimize the shine and keep cheeks looking fresh. Lancôme Blush Subtil: This is an oil free, oil absorbing powder blush that has a hint of shimmer. While there are many great products that work well for skin that tends to blemish, there are a few products to avoid. Crème blush often contains emollients, or oils, and this can aggravate acne. Cheap makeup products are also a good idea to avoid; these may or may be made with inferior ingredients that could also aggravate pimples. Apply a thin layer of foundation over the face, and follow with concealer on any areas of the cheeks that have blemishes. Concealer is an important step because it prevents the blush from setting on the blemishes and attracting attention to them. Once the concealer has dried, use a light hand to apply the blush, starting at the apples of the cheeks and sweeping upward toward the temples. Use a loose or pressed powder to finish off and set the foundation, concealer, and blusher.